Malassezia dermatitis, also called yeast or fungal dermatitis, is caused by a type of yeast (fungus) found on the skin and in ears of dogs. Though a normal inhabitant of these areas, an abnormal overgrowth of this micro-organism can cause a skin inflammation (also called dermatitis). This inflammation leads to visible symptoms on the dog such as smelly ears or skin, stained fur and itching. It can be often triggered by an underlying disease such as skin allergy (also called atopy). 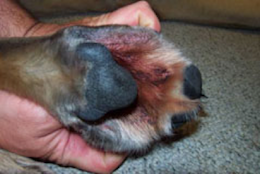 It also can be triggered at sites in the dog's body that are exposed to increased warmth and moisture such as in the ears and between the toes. Because of these predisposing factors, affected dogs can be prone to repeat bouts of Malassezia dermatitis throughout their lives and may require routine cleaning of affected areas to prevent recurrence. An overgrowth of yeast may cause skin irritation and hair loss. Common signs are reddened, greasy and smelly skin. The smell of Malassezia dermatitis is often very noticeable and could be described as yeasty or musty. In chronic cases, the skin will also become thicker (lichenification) as the skin attempts to protect itself against the yeast overgrowth. The armpits, lower neck, ears, feet and nail beds are most commonly affected. The fur may become stained red with chronic infection. This is fairly common between the toes or on the chops. Affected skin patches over time can also become darker (hyperpigmentation), this is another protective mechanism that develops in the skin to cope with the overgrowth of Malassezia. 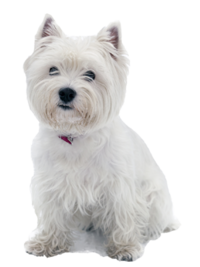 Some breeds of dogs are particularly susceptible to Malassezia dermatitis, including Cocker Spaniels, Poodles, Basset hounds and West Highland White Terriers. Consult your vet to diagnose the problem and treat any underlying conditions. It's quick and simple for your vet to check for yeast with a painless sample from the skin checked under the microscope. Help control the condition by using a high-quality topical product - choose shampoo or mousse for large areas of skin or pads for small areas.  Choose a product that will clean and soothe the skin and restore balanced skin microflora. 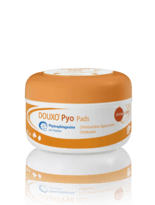 DOUXO® (R) Pyo contains both phytosphingosine and chlorhexidine to restore the skin's microflora balance, support the skin barrier and have an antibacterial action. Continue with regular skin care: Affected dogs can have repeat episodes of Malassezia dermatitis, especially if caused by an underlying condition such as skin allergy. It's a good idea to continue with routine care of the skin using a product specifically for maintaining balance in the skin microflora.